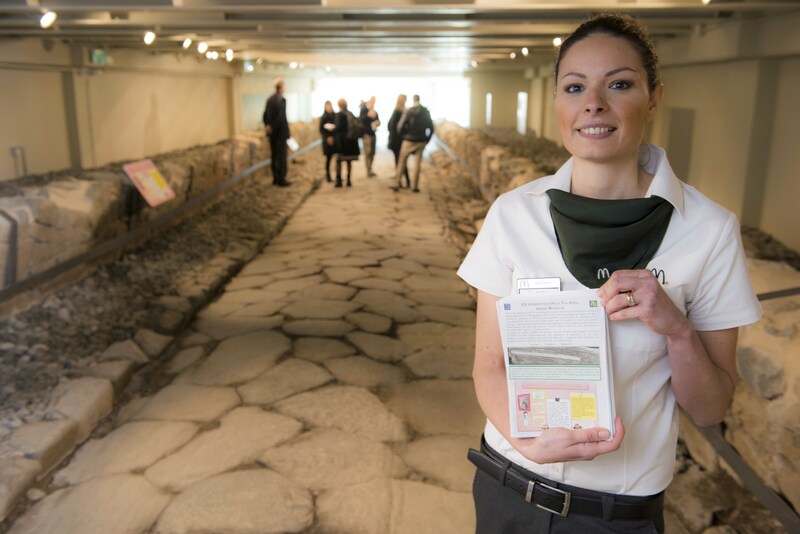 On Tuesday, February 21st, the first archaeological museum underneath a McDonald’s opened in the Frattochie ward of Marino, a town about 12 miles south of Rome. 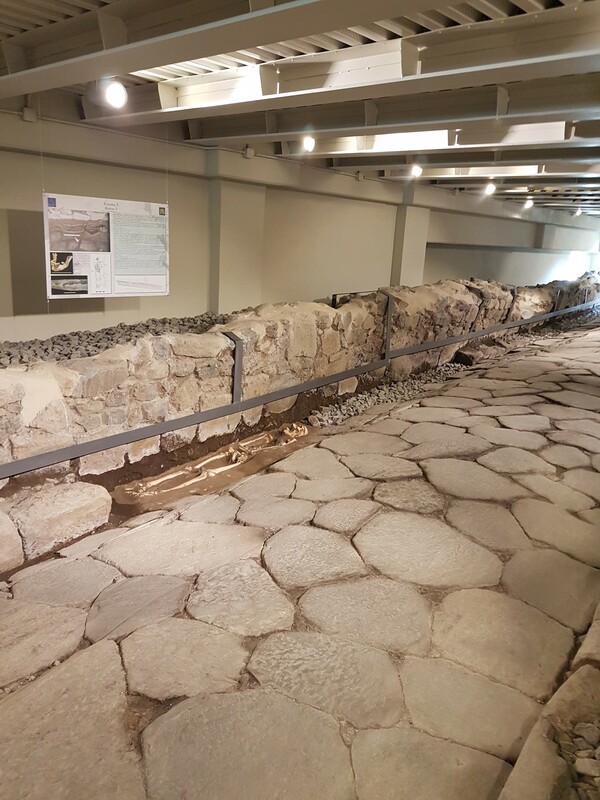 The museum was built around a pristine stretch of Roman road dating to the 2nd/1st century B.C. discovered in 2014 during construction work on a new McDonald’s. 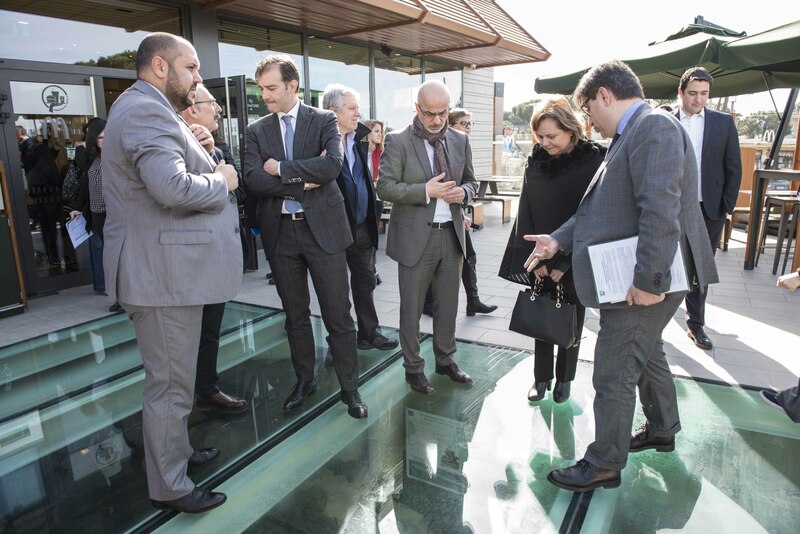 McDonald’s Italia financed the conservation of the road to the tune of 300,000 euro ($317,000). 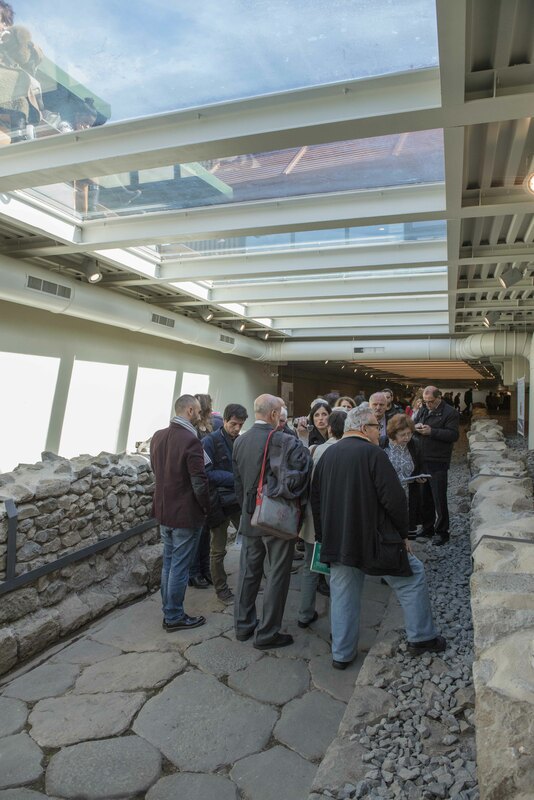 The local Archaeological Superintendency supervised its careful excavation and the installation of underground museum gallery. The restaurant was still built over the site, but it was designed in a bridge-like shape with transparent flooring that makes the Roman road visible under your feet both when you’re waiting inside for your Royale with Cheese and when you’re sitting outside on the patio. If you prefer to eat elsewhere, what with being in Italy and all, you can still visit the underground museum. It has independent access so you don’t have to walk through MickyD’s to get to it, and entrance is free of charge, courtesy of the Clown. The road begins near the XI mile of the Via Appia. It’s stretch 45 meters (148 feet) long paved with slabs of siliceous rock bounded on both sides with opus incertum walls made of medium to large pieces of local volcanic rock (peperino and basalt) set in a grey mortar. The ruts of hundreds of years of wagon wheels are deeply embedded in the pavers. The average width is 2.1 meters (a hair under 7 feet). Going towards the Appia, a u-shaped drainage canal runs along the right side of the road, while on the left side the edge stones survive in excellent condition and there’s a little sidewalk .8 meters (2.6 feet) wide. 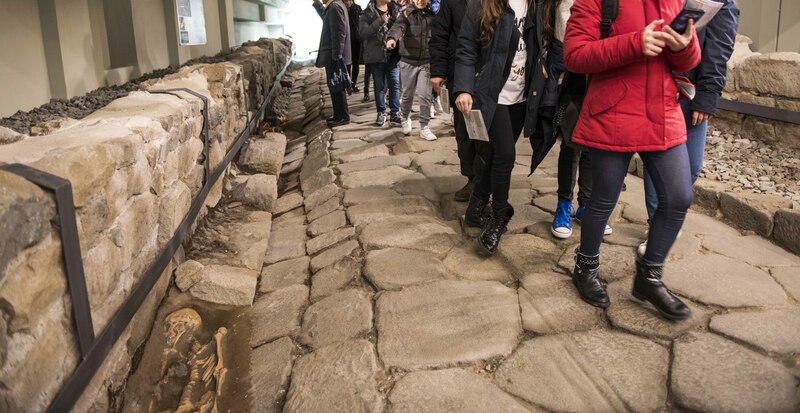 There is evidence that the road was repaired repeatedly in antiquity. Frattochie, next to Castrimenio, is the modern descendant of the ancient Roman town of Bovillae, the legendary place of origin of the Gens Julia. According to the founding myth of Rome, its father city Alba Longa was destroyed by Roman king Tullus Hostilius in the 7th century B.C. and all of Alba Longa’s sacred objects were moved to Bovillae. These objects and the rituals connected to them were the foundations of Rome’s religions, so Bovillae became an important (and wealthy) religious center. 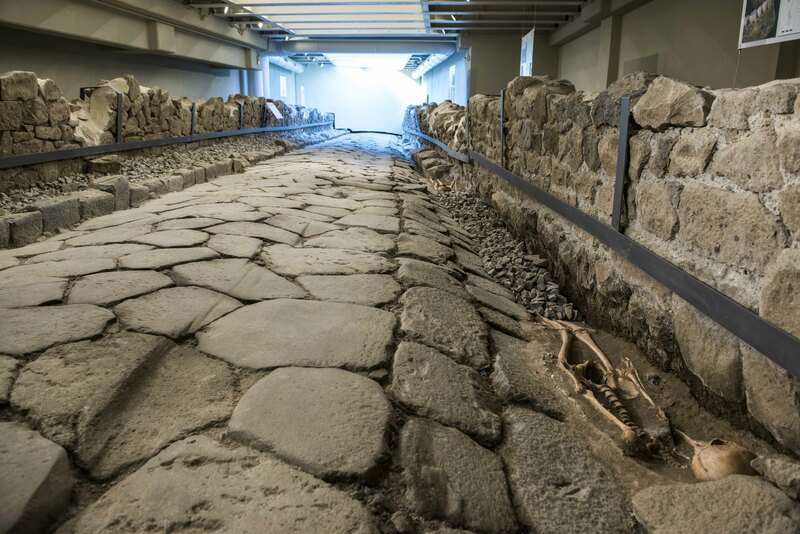 The offshoot of the Appia was likely built for the benefit of a wealthy noble resident of Bovillae who wanted a nice, properly paved road to take him to his doorstep. Bovillae reached its peak when the Julians came to prominence in Roman politics. Augustus’ body lay is state there before returning to Rome, and Tiberius invested heavily in public buildings including a theater, a circus and a chapel dedicated to the Gens Julia. The town declined after the Julio-Claudians died out in the 1st century. By 326 A.D., it was so insignificant it didn’t garner a mention in a document wherein Emperor Constantine I donated land that included Bovillae to a cathedral in Albano Laziale. Whatever was left of it must have suffered greatly when Alaric I sacked Rome in 410. The towns along the Via Appia were the first to feel the Visigothic wrath. Following the fortunes of the town, between the 2nd and 3rd centuries A.D. the road fell into disuse. It became overgrown with vegetation and covered with soil. The locals put the path to good use. Like the Via Appia, it was lined with burials and tombs. One of the tombs is still visible today on the property of the Abbey of Our Lady of the Holy Sacrament, a Trappist monastery in Frattocchie which, just fyi, makes outstanding chocolate. 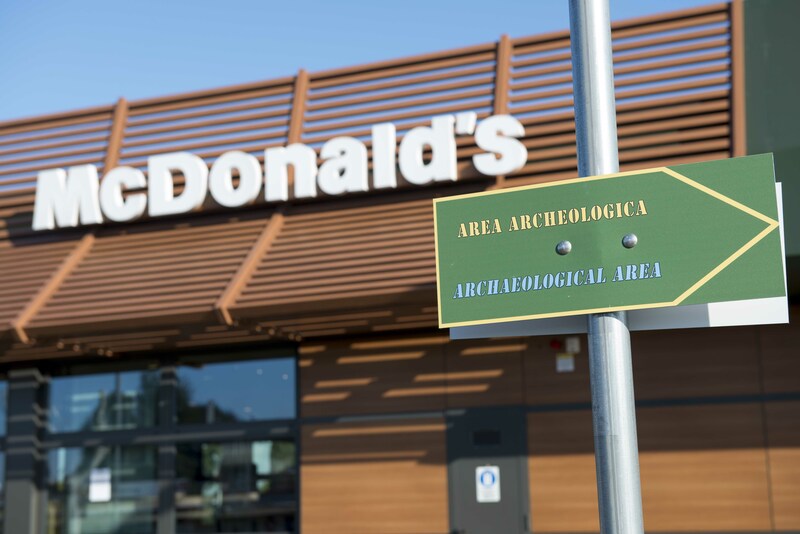 The McDonald’s excavation unearthed the skeletons of three adult males buried in the 2nd-3rd century A.D. along the stretch of road. Each was in his own grave, with the three graves relatively close together towards the center of the surviving road section. Casts of the skeletons have been placed in the locations of the original graves along the road in the underground museum.